I’ve always loved superheros. When I was in the Navy a group of us would get together on Sundays while we were out at sea and play Champions. We would also do D&D (we replaced some of the combat rules with Arms Law and Spell Law), but Champions was the fun “beat the crap out of bad guys” game. So, when I learned that there was going to be a Champions Online game it made me happy, but cautious. Would they do it right? Would they use the rule books as foundation for the online play? Would the quests be any good? The answer to all of the above is no. Not just no, really, but Hell NO! I did a one month subscription while it was on sale and it is probably the worst MMO out there as far as being fun really goes. Character creation is a formulaic as every other MMO and even when doing a costume design there are some items only available if you choose this option and not if you choose that one. Stupid. I could go on and on about it, but Shamus over at Twenty Sided has already said most everything I could thing of about this sad example of a good RPG turned into a lousy MMO. Starting off, I decide to create the quintessential silver-age superhero. Not one of these brooding black-caped, spike-covered, angst-ridden antiheroes like all the young people are into these days. I want someone wearing classic tights and using classic iconography. But not, you know, operating under the same silver-age idealism and respect for all life. Heavens no. I’m going to have the same approach to fighting crime as The Punisher. I’ll just be wearing stretchy clothing and a brave smile when I do my vigilante-style killing. I will leave you with this though. A screenshot of my character Warlord. He was supposed to be named ‘Warlock’ since his powers were magically derived but that name was unacceptable to the server, so was ‘Warhawk’ and ‘Warsong’. No idea why, it just was. 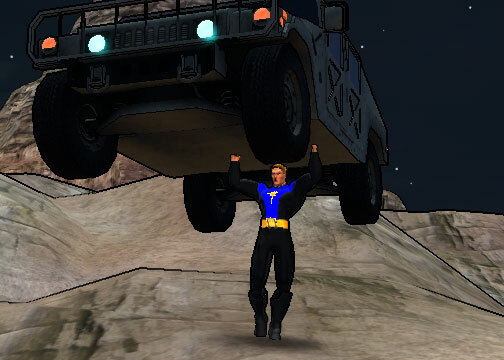 I will also add that while Warlord, as you can see, is strong enough to lift a Humvee with a curb weight of 5,900 lbs, he was still not strong enough to knock out a street thug with one punch.